Watched The Doctor, the Widow and the Wardrobe on Amazon. Watched The Snowmen on Amazon. Watched The Time of the Doctor on Amazon. I know this is the third Doctor Who Christmas special I watched this year, because I've been catching up on years I've missed. But it was the only one that I watched on "Christmas in July." I watched the 2014 Doctor Who Christmas special, Last Christmas. I had planned on watching it on the 25th, but circumstances worked against me that day and every day until now. And... hopefully I'll write my review tomorrow. I watched the 2015 Doctor Who Christmas special, The Husbands of River Song. I watched the 2016 Christmas episode of a webseries I've been catching up on recently, "Grumpy Princess Show." This morning I tried the cereal my sister bought the other day, Sugar Cookie Toast Crunch. It was yummy. Watched the new special My Little Pony: Best Gift Ever. I should mention that I recently ordered something to share with the fam at Christmas, and it arrived in the mail yesterday. I won't say what it is yet, because it's a surprise. (The order also included something just for me, a set of three DVDs, one of which I'll be watching sometime near Christmas.) Also, a couple of days ago I bought some old-fashioned Christmas candy at a dollar store, to share at Christmas. And today, I have made a Christmas comic at stripcreator. I added five videos to my YouTube playlist of Christmas songs. (Four of them are new this year; one is from 1998, but I only just discovered it.) Also on the page where I have that playlist embedded, along with a list of the songs on it (so I can find replacements if any of the vids get deleted from YouTube), I decided to add years of release next to each song on the list. Just for the heck of it. I watched the new special A Legendary Christmas with John and Chrissy. Today I've been selecting some Christmas mp3s to possibly download and burn onto a CD (which I haven't done since 2015). Right now I've got 23 songs in my mp3 cart on Amazon, but I probably won't buy quite that many. Anyway, I'm not going to figure it out tonight. Meanwhile, I deleted the very first video on my YouTube playlist because it got blocked. And I added another video to the end of my playlist. Well, it's Krampusnacht. So I downloaded one of the mp3s from my cart, the end credits music from "Krampus." Also I played some Pokemon Black... this is the reason I started my latest playthrough, a month or so ago. To catch Kyurem and name it Krampus. It's nice to have fulfilled that plan, today, but now I don't suppose there's much more I can do. Well, I beat Cynthia, and the first of the Elite Four. I'll finish the other three some other time, but after that there's not much to do, probably. Anyway... it is also a new tradition (started in 2016) for me to watch a holiday horror movie on Krampusnacht, and the one I'll be watching tonight is Better Watch Out. I watched a DC Kids holiday special on YouTube. It was originally scheduled to air at 6:30 AM, and amazingly enough, I was awake at that hour. But it didn't come on. Eventually the time the page said it would start changed to 9:30, and then it changed to 10:30. Finally it came on around 10:38. It was frustrating waiting so long, but once it did, it was fairly fun, I guess. Then in the evening, Beth and I put up a tree. A real one. It's been awhile since we had a real one. This week's episode of What They Got Right was about the movie "Elf." I watched last Friday's episode of "Speechless," which wasn't a Christmas episode, but the episode started with the DiMeos having put up their Christmas tree earlier than usual. I also watched last Sunday's episode of "Bob's Burgers," which was technically a Christmas episode, though only as part of the B-plot, in which Linda (and later Bob) tried knitting scarves as Christmas gifts for the kids. Last year I bookmarked a list (on iHorror) of Christmas horror short films to watch. But I didn't watch any of them last year. Sometime this year, not too long ago, I watched the first one on the list, Humbug, but I didn't get around to writing a review of it. Well, I rewatched it tonight, and this time I did write a review. And I watched the second film on the list, "Do You See What I see? ", which I had previously had on a list of short films I wanted to watch. Well, now that I've seen it, I thought it was definitely okay, but I didn't really feel like writing a review. Also I watched the third film on the list, "Deathly Presents," though I had seen it some time ago because it was part of an anthology called Bloody Cuts. And then I started a new subsection of short film reviews for Christmas shorts, listing a number of films I had previously reviewed, as well as "Humbug." There are some more films I need to watch on the iHorror list, but I definitely think I've done enough for tonight. Watched tonight's Christmas episodes of "American Housewife" (with guest star Patrick Duffy), and "Modern Familiy", and "Single Parents." First I wanted to mention that a couple weeks ago, there was an episode of "Midnight, Texas," which wasn't set at Christmas, but Olivia found that her father had created a fake family for himself using a spell and his memories of their last Christmas together. That was... interesting. I'm sorry I didn't think to mention it here at the time that I watched it. Anyway, today I've been working on my Christmas commercials. First I looked for new copies of old ads that had been deleted since last year. Then I added some of this year's new ads. I also added an old commercial (which I'm assuming is from 2013, just because that's when the video I found on YouTube had been uploaded), which I had forgotten about and so hadn't previously included on my playlist. The reason I discovered it this year is because both that ad and one of this year's ads involved ugly sweaters. Also I made a page for a series of Target ads from last year. The Christmas season began on Cookie Clicker. And I watched a clip from "The Daily Show" on YouTube, called Thanks, Santa - A Cold Dose of Reality for the Holidays. It was pretty funny. Also tonight I watched the 2016 Doctor Who Christmas special, The Return of Doctor Mysterio, on Amazon. And I watched the new Christmas episodes of "Fresh off the Boat" and "Speechless" on Hulu, because when they aired last night, our ABC station wasn't working. And I watched the short film A Christmas Treat. I watched last night's cold open of SNL, It's a Wonderful Trump, on YouTube. And I added it to my It's a Wonderful Life parodies page. And there was another holiday episode of "Life Hacks for Kids." I watched a TV movie from last year, Angry Angel. Watched a new holiday episode of DC Super Hero Girls called Fortress of Solidarity. And I watched the series finale of Timeless, which happened to be set at Christmastime. Watched a short film on Crypt TV called Milk & Cookies: Walter's Revenge. It's a sequel to a short I watched last year, but didn't think much of. But the sequel was better, so I started a little page for both shorts. Also... so, this is Friday. On Wednesday there was a Full Frontal with Samantha Bee special, "Christmas on I.C.E.," which I wanted to watch, but didn't get the chance. Although that night probably a little while after the special ended, I watched a "pre-show" on YouTube. And tonight, I watched at least some of the special itself on YouTube. It was broken up into parts 1, 3, 5, 6, 7, 8, and 9. So either they're not putting parts 2 and 4 online, or they've misnumbered the segments. Well, I may yet get a chance to record the special on TV, and see whether or not there are any bits I've missed. And until then, I may wait to write a review. But for now, at least I can say I liked the parts that I did see. There was already another holiday episode of DC Super Hero Girls: Super Gift Swap. Also today I finally got around to buying some more Christmas mp3s and downloaded them. Hopefully tomorrow I can burn a new CD. Also tonight I watched a Christmas episode of "The X-Files" from 1998, on Hulu, just because I could. Last night I DVR'd a rerun of Christmas on I.C.E., which I watched today and wrote up a review. Also today I bought a couple more mp3s, and burned my Christmas Mix 2018. And I watched the 2004 TV movie Samantha: An American Girl Holiday on DVD. It was a lot less Christmas-y than I expected, but it was pretty good, and at least it ended on Christmas. And I watched a clip from The Daily Show on YouTube: CP Time: Black Christmas. And another holiday episode of "Life Hacks for Kids." xkcd has a comic called Christmas Eve Eve. Also today many of my relatives gathered at my grandmother's house to celebrate my uncle Wayne's birthday. 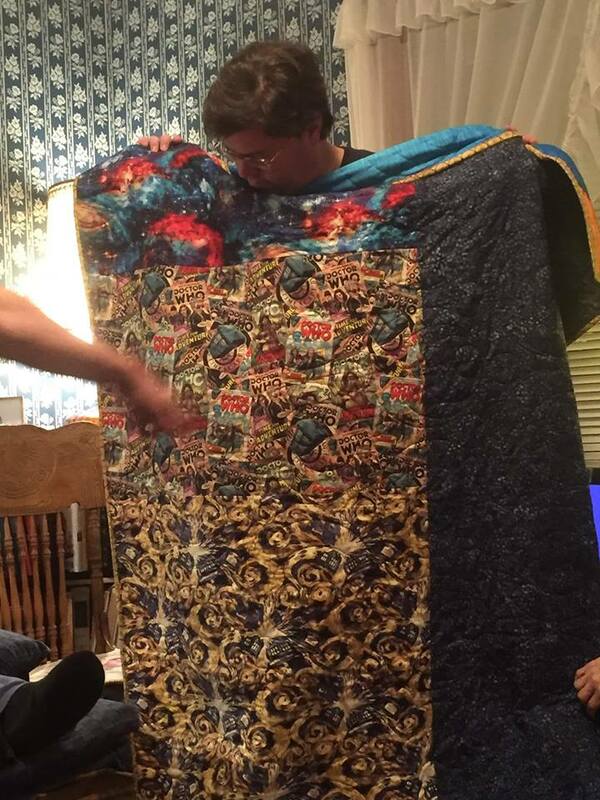 We didn't exchange any Christmas presents, as we usually do on Christmas Eve, but I did bring the surprise I ordered back in November to share at Christmas (since more relatives were there tonight than I'll be seeing on Christmas itself). So now it is time to reveal the surprise: Gummy Dala Horses! And when we got home, I watched "White Christmas." I'll try to write up a review tomorrow. And I watched the 1982 Christmas episode of "Voyagers!" on DVD. I slept in a lot later than I should have. Then I got up and had a cup of "Sip and Be Merry" tea with a packet that had come with my last Republic of Tea catalog, a few weeks ago. That was good. And Mom, Dad, Beth, and I opened some presents. And a little later we'll go back to Grandma's house for Christmas dinner and more presents. 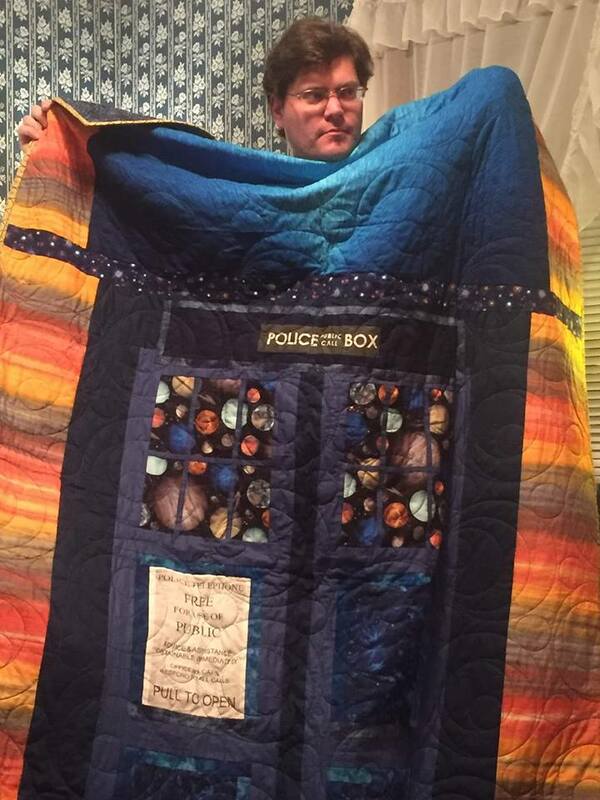 ...Well, I got some good things, including an awesome Doctor Who quilt made by my aunt Kathleen. (front, back) And when we came home, I wrote up my review of White Christmas. Uncle Wayne and Aunt Kathleen and Uncle Alan and Aunt Brenda and I went out to see Mary Poppins Returns. That was fun. Afterwards, we went to Walmart, where I bought a pack of Sam Adams Winter Classics. I usually like to get this earlier so I can drink it actually on Christmas, but I didn't get a chance this year. But I've got it now, and it's still the holiday season until New Year's Day, so it's fine. Today Mom and Dad and Beth and I finally unwrapped the last few presents we didn't get to on Christmas. Later, I started watching an animated Christmas movie that came out last year, but I wasn't sure I wanted to buy, at the time. And I eventually discovered that it was available on Amazon Video, included with Prime. And since I have Prime Video this year, I could watch it without having to pay for it. So... I thought I'd watch it the Saturday before Christmas. 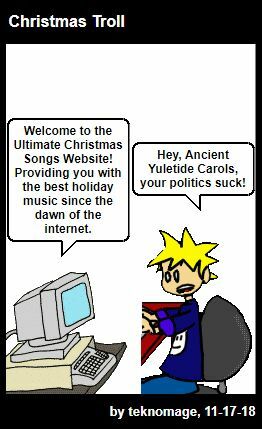 However, our internet wasn't fast enough that night, so I put it off, and didn't get to it til tonight (Friday, three days after Christmas). Then about 20 minutes in, the internet got too slow again, so I stopped watching it. I'll try to finish it tomorrow, hopefully. Well, I still haven't finished watching that movie on Amazon. But I did watch a New Year's episode of Life Hacks for Kids, and started a page for New Year's episodes. I have a lot of work yet to do on it, but maybe I can finish it up tomorrow, as well as finishing that movie. We'll see. Still haven't watched the rest of the movie on Amazon, and I haven't finished the New Year's episodes page. But I did finally watch the New Year's episode of Murphy Brown that aired a couple weeks ago. Also, last night I watched a few episodes of The Twilight Zone on Amazon, since I don't get Syfy. I'll try to watch a bit more of that tonight, I guess. Because it's a tradition I've been missing out on for a lot of years, now. I finally finished watching that movie on Amazon, All I Want for Christmas Is You. I think that means Christmas is now over, for me (even if our tree is still up). There are plenty of things I wanted to do over the holidays that I never got around to, but I got to enough things to be satisfied, I guess. Beth undecorated the tree and had me take it out of the house, today.